'Gitano' (Keith Keppel, R. 2007). Seedling# 99-48N. TB, 36" (91 cm), Midseason late bloom. Standards peach (M&P 9-AB-4); style arms apricot salmon (10-C-5); falls imperial purple (45-L-10), edges slightly lighter, pale apricot salmon (10-B-4) sunburst pattern veined salmon tan; beards solid red-orange (2-C-12), lightly velvet. 'Last Laugh' X seedling# 96-47D: ('Prince George' x 'Braggadocio'). Keppel 2008. Honorable Mention 2010; Award of Merit 2012. From AIS Bulletin #348 January 2008 Introducing GITANO ML 36" (Last Laugh X (Prince George x Braggadocio)) Wild! 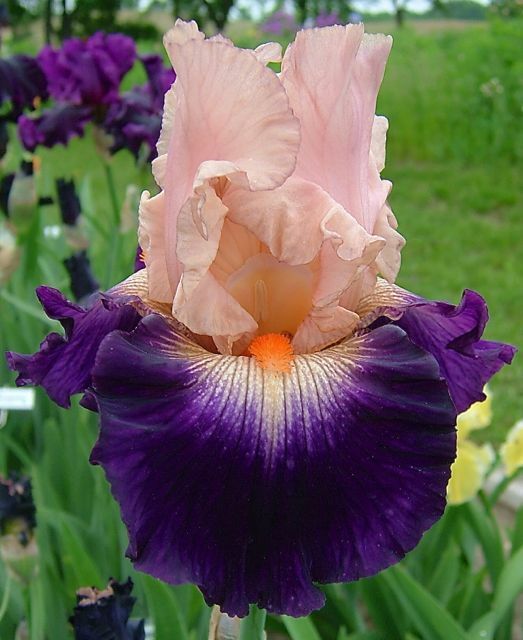 Peach standards over purple falls with apricot sunburst and solid red orange beards. #99-48N. $50.00. Keith Keppel.